Now, if that isn't a classy title for a regiment, I don't know what is! 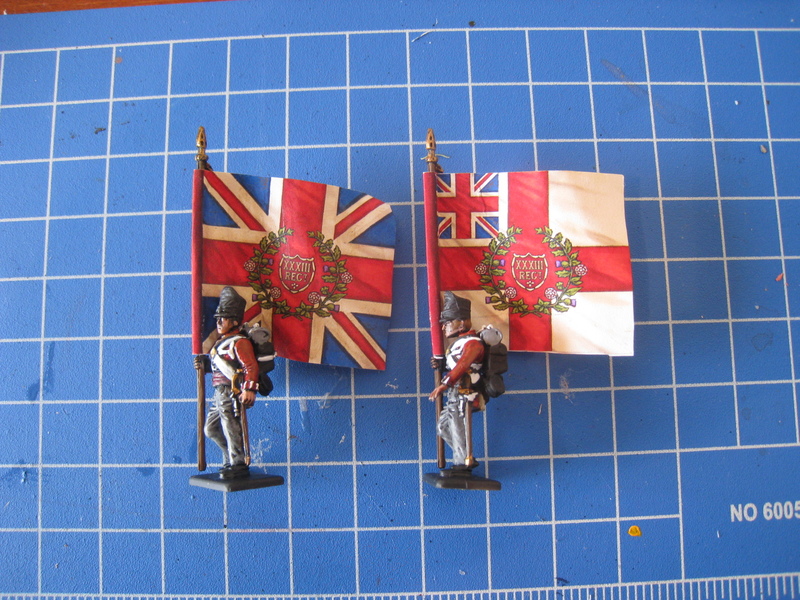 These chaps also were known as "Duke of Wellington's Own"- which has in modern terms simply become the Dukes. 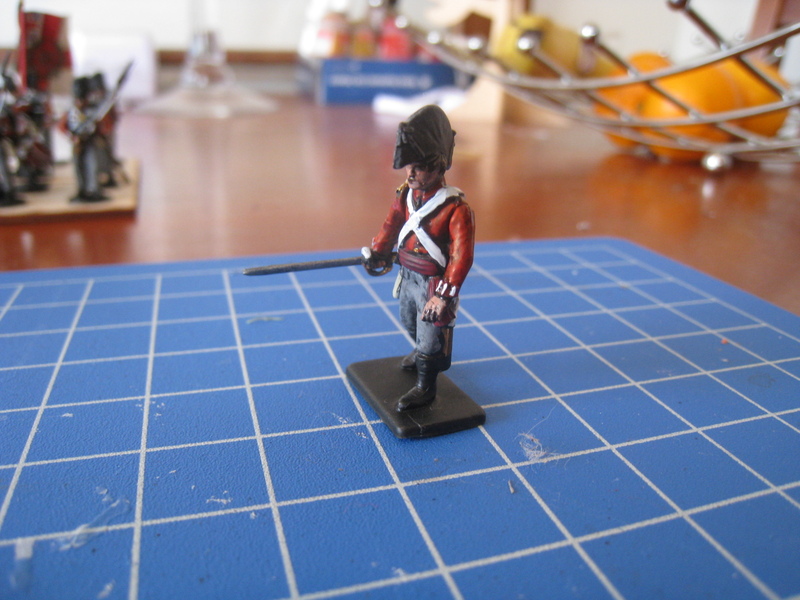 They got the title as they were the regiment that Wellesley served with before his meteoric rise to dukedom! 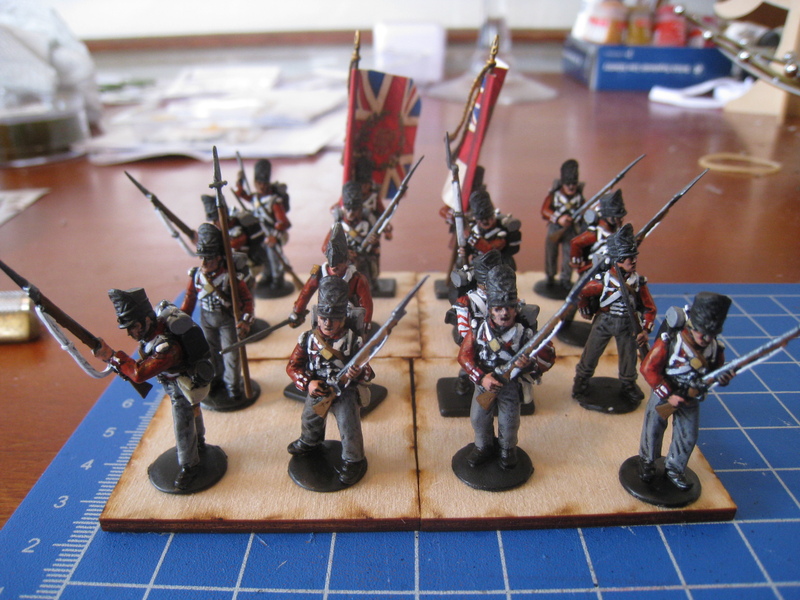 Here is the full regiment, a normal sized lasalle unit. 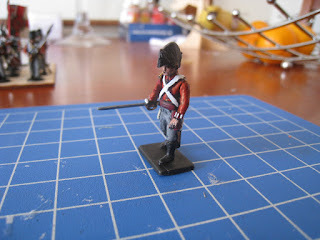 Now there has been a bit of talk this week about Lasalle basing, and how many figures per base is appropriate (here). 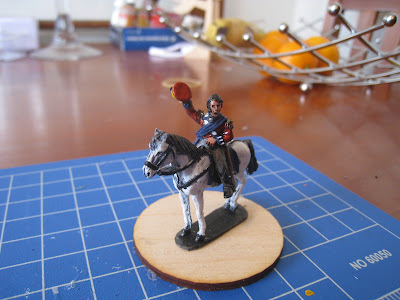 I am going to opt for 4 per base, but I will make up a couple of mock bases and show you guys in the future, just to see what you think. Anyway, back to the 33rd. 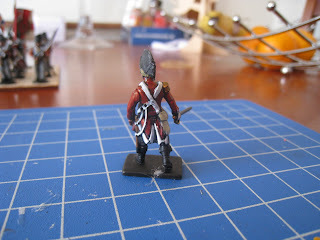 Now, one of the guys down at the club had some spare Victrix peninsular sprues, which I gladly snapped up, so here is the officer for the 33rd, still resplendant in his Peninsular uniform- including Bicorne! 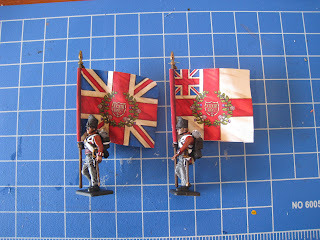 The Kings Colour and the Regimental Colour, from GMB designs. More about flags tommorow however! 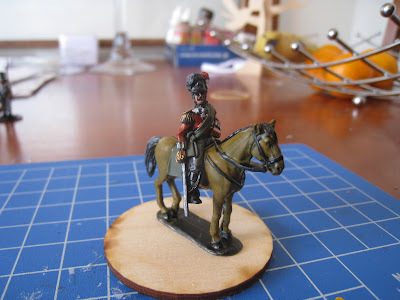 And second is a Hanoverian Landwehr commander, which was converted using Victrix Hanoverian parts, and marrying them to a Victrix Highlander- with a very good result in my opinion! This chap will be in charge of my Hanoverian detachment (Brunswick Support in Lasalle). And what of an anecdote from Waterloo? Well, the story of Lord Uxbridge (the commander of the British and allied cavalry) is probably the strangest (and possibly untrue). The story goes that late in the day that Uxbridge rode off to meet Wellington, to tell him to get back off the front lines, for fear he might get shot. The Duke of Wellington: "By God, sir, so you have!" The only thing this story reminds me of? Is Monty Python. They are looking great Poochie- can't wait to see the finished army- are you going to have them ready for Call to Arms? Finally, how long are you finding it takes to paint them? Well.. I have 5 units left to paint before CTA- and a month to do it in! So... I need to get myself in gear! How far away are Pavlov's Grenadiers?